It provides information to help infant teachers, to plan for and provide enjoyable and appropriately challenging learning experiences that will allow all children grow and develop as competent and confident learners. In Scoil an Linbh Íosa, we pick a theme per month such as Homes or Hospital, and allow the children to explore it through various activities such as role-play, story, play, construction and creative arts. The children get a chance to participate in each activity as the month progresses. 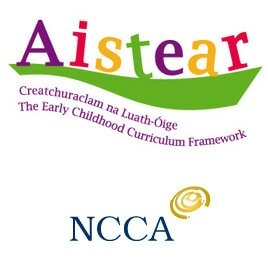 Aistear is often described as the best part of the day and is a firm favourite with the students.